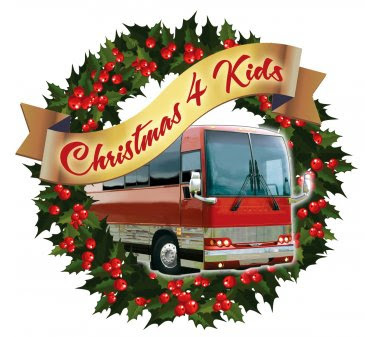 Nashville, Tenn. (December 7, 2015) - TheChristmas 4 Kidsorganization has announced its lineup of participating artists for this year's annual tour bus show to be held at the Hendersonville, Tennessee Walmart. On Monday, December 14 from 5-9 PM, stars will gather on parked tour buses to meet fans and give them an inside look at a country artist's home on the road. This year's participating artists include Darryl Worley, theBellamy Brothers, Shenandoah,Lonestar, Trick Pony, Craig Wayne Boyd, 3 Doors Down, .38 Special, Lucy Angel, Guy Gilchrist, James Robert Webb and more. On Tuesday, December 15, over 400 underprivileged children from 29 different schools around Middle Tennessee will participate in a day-long shopping excursion. This special day consists of a chauffeured trip from their school aboard an entertainer's luxury tour bus, dinner, and a party hosted by Santa and Mrs. Claus at The Hendersonville Expo Center. To wrap up the day, the tour buses journey to the Hendersonville, Tennessee Walmart, where the kids receive a brand new winter coat, and $150.00 to spend on anything they like. Christmas 4 Kids is a not-for-profit organization that has been in existence for over 25 years providing many children, each year, with a very special Christmas gift.